Operational Amplifier Circuits provides a single source of information covering the basic principles of operational amplifier circuits. Operational amplifier applies to a very high gain, differential input, direct coupled amplifier whose operating characteristics are determined by external feedback elements. This work contains five chapters. Chapter 1 describes the characteristics and application of an ideal operation amplifier, as well as the operation of inverting and non-inverting amplifiers. Chapter 2 discusses the concept, principles, and application of frequency response, slew rate, and bandwidth. 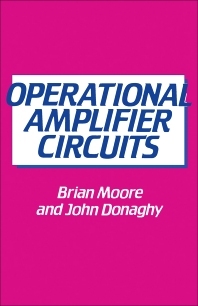 Chapter 3 deals with operational amplifier circuits that generate signals. This chapter specifically tackles the four common circuits, including square, triangular, sawtooth, and sine waves. Chapter 4 explores the classification, characteristics, and mode of operation of power amplifiers and power supplies, while Chapter 5 highlights the selected application of operational amplifiers. This book will prove useful to electronics and design engineers, technicians, and electronics students. Brian Moore received his B.A. in Natural Sciences in 1968 and his Ph.D. in Psychoacoustics in 1971, both from the University of Cambridge, England. He is currently Professor of Auditory Perception in the University of Cambridge. He has also been a Visiting Professor at Brooklyn College, the City University of New York, and the University of California at Berkeley and was a van Houten Fellow at the Institute for Perception Research, Eindhoven, the Netherlands. He is a Fellow of the Acoustical Society of America and a member of the Experimental Psychology Society (U.K.), the British Society of Audiology, The American Speech-Language Hearing Association, The American Auditory Society, The Acoustical Society of Japan, the Audio Engineering Society and the Association for Research in Otolaryngology. He is President of the Association of Independent Hearing Healthcare Professionals. He has published 10 books and over 280 scientific papers and book chapters.